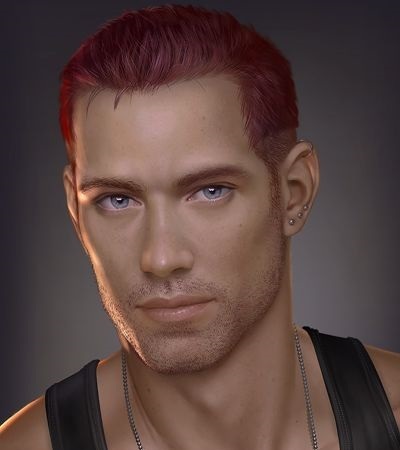 Marl Law is a handsome 6'3" and 220 pounds, with red hair, which he usually wears high and tight, and blue eyes. He has the hard body of an athlete and even before his powers manifested he was a standout football player. As captain of the varsity he led his team to a pair of consecutive championship that would have been three but for the ending of the last game. He dresses as he has always in jeans, sneakers, polo shirts and a lettermen's jacket. As a little consession to Carine, Mark has loosened up just enough to have a row of studs shot into one ear. Feet pounded the bleachers in time with the music adding to the chaos. Lights overpowered the night, erasing the full moon and stars from existence. Twenty-one boys took up their position while the last scanned the array from left to right. Three quick barks and everything began to move. As over a dozen collided the one dropped back from the melee, bringing the ovoid to his ear as he searched the distance. A target streaked left to right, pursued closely by another. The secondary hooked in but was blocked. The third had become entangled with two. Seeing no option, the arm came down to tuck the ball in tight and the carrier took off. All eyes turned to him as the few on the field zeroed in on his movements like a homing missile. The first to reach him met a hand to the top of his head and was pushed aside. The next two arrived in tandem only to be deflected by the runner's teammates. The last waited, judging the point of intercept and launched him self. Four yards short of the line the boy lunged, willing to sacrifice his body to bring down the runner but when he hit the tuff his target was gone. Two thousand four hundred and six watched the runner, Mark Law, vault the defender and sail across the goal line, thirty feet in the air. About a thousand began to celebrate. Another thousand booed. The remained stood in silent awe or sudden, determined hatred. One grinned broadly as his son landed on the clay track fifteen yards beyond the goal posts. On October 25, 1983, Mark Law was born on an army base just as millions of children before him. His father, a career US Army officer, was at that moment making a landing on the Caribbean island of Granada as Company Commander 'Easy' Company, 1st Ranger Battalion, 75th Ranger Regiment. The elder Law commanded his men with a stern, competent, fairness that made him a popular commander and placed him on a fast track up the ladder. Captain Law remained with the 1st Ranger for much of Mark's life advancing to Major by the time the 75th joined in the invasion of Panama in 1989 and the Lt. Colonel in 1991 for Operation Desert Storm. When his 17 year old son manifested his powers during a football game, Law had attained the rank Lt. General and was stationed at the Pentagon. General Julius Law beamed at his son, his desert blasted face unaccustomed to outward displays of emotion. The man, Miller, had arrived three days after the controversial finish to what would be his son's last game and offered the boy the world. Mark looked up at his normally stoic father, his face a mask of confusion. "I CAN go, right, dad?" The boy said. The man clinched his fists above his chest in obvious jubilation. "YES!" he declared. "Of COURSE you can go!" Throughout the boy's life he had worshipped his father, proud of his military service to his country. No one, including Mark ever doubted that he would follow in his dad's footsteps and become a Ranger. The sudden revelation of his superpowers change only one thing, Mark would NOT be going into the Army; instead he would become a new type of warrior, defending his country at home. Without hesitation he chose the codename 'Ranger' and joined the Minutemen. 'Shock and Awe'. Hit 'em hard, hit 'em fast and hit 'em until they're down for the count. Mark is very strong compared to nearly anyone he'll ever meet ... except Nat Ryan. He is well trained in hand-to-hand and his ability to fly is a huge advantage. He's tough and can take any hand held weapon short of an anti-tank missile. Mark is very much like his father, a no nonsense patriot willing to do whatever it takes to fight for his country and win. As he was raised with the military in mind he already has a grip on the requirements of the service, even the superheroes service, and is confident he will be able to lead his team with the same distinction as his father. From the beginning he assumed that he, as the oldest of the team and the only one with some type of military heritage, would be the leader. The others, all civilians and all very lost in the whole 'super powers' thing readily deferred to his leadership never bothering to question if it were the right choice. One thing Mark has not been forced to confront is that his decisions in battle just might jeopardize lives, his team's or the innocents that might be involved. By the time the group that would become the Legacy arrived, Mark was firmly established as the TEam REd leader. To the Legacy team he is a combination proctor and teacher aide and just as he did with the earlier members, he works to dominate the new recruits but has found them, particularly Nat Ryan and Wren Collins, far from malleable. Though his heart is in the right place, knowing he must protect the United States, Mark lacks any real leadership abilities other then a loud voice and dynamic personality. If at some point in the near future he comes to realize his limitations, he will become exactly what he envisions, an American hero. Until that time his regular confrontations with Nat Ryan, and Ryan's refusal to knuckle under as well as stalwart defense of his Legacy team, will continue to be a problem for both. Ranger is a traditional 'flying brick' with extensive military training including hand-to-hand combat training.